After we decided to make Sun Peaks the destination for our annual snowboard trip, we began exploring other winter activities beyond our usual itinerary of snowboarding, cold beer and hot tubs. With so many options to choose from, it was hard to narrow down the list, but one adventure jumped out and caught my attention – the Snowshoe Campfire Cookout and S’mores. 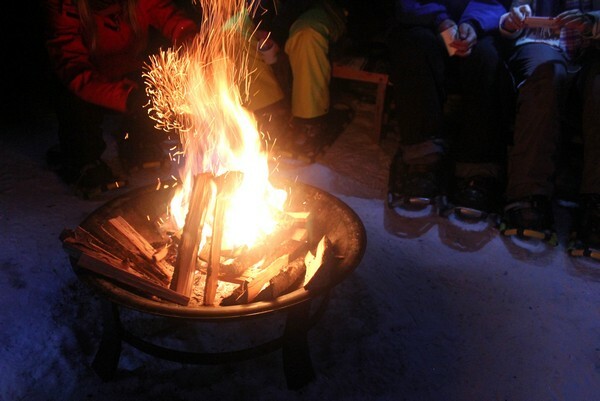 This exciting evening event starts off with an easy 1km snowshoe tour through beautifully snow covered forest trails to our cozy winter camp, where a cookout around a roaring campfire awaits. The return journey offers amazing views overlooking the village and allows participants to make fresh tracks of their own. I can’t remember the last time I had the opportunity to sit under the moonlight by a campfire in the middle of winter. It sounded like the perfect way to get some exercise, socialize and have a unique mountain experience. The tour begins at the Village Day Lodge, steps away from our room at the neighbouring Coast Sundance Lodge. After a quick safety briefing and equipment check, our group of 15 straps into our snowshoes and heads for the hills. Aside from our guide Rob O’Toole, a long time resident of Sun Peaks, I’m the only Canadian on this particular tour. Our group spans four continents, joined by a family of five from Australia, a trio of German girls and three couples from Brazil. It’s an interesting experience being on a tour in your home country, especially when the others are from far away lands. As Rob describes the mountain terrain and history of Sun Peaks, I find myself more interested in the questions and responses from the rest of the group. I’ve been on countless tours overseas, so I’ve been in their position before – curious and open to learn about a country’s culture, history and interesting factoids. But this tour was a completely different experience for me, one that had me highly in tune with my “Canadianism”. After a mellow stroll along the Nordic trail at the base of Mount Morrisey, we arrive at the quaint mountain camp. Rob quickly jumps into action and gets the campfire started. It’s a chilly night with temperatures well below freezing, so the warmth of the crackling fire is welcome. Rob circles the group, filling our cups with hot apple cider. Now, as a Canadian, hot apple cider on a cold night is quite normal. But, to some of the others, this was a peculiar choice of beverage to consume by a campfire. For them, this was an authentic Canadian experience. 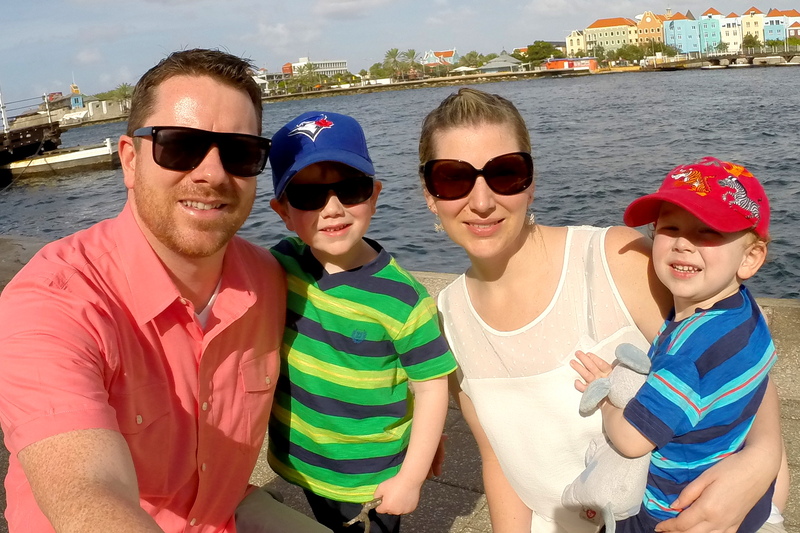 It was fun watching them experience a side of Canadian culture that I often overlook. Long metal skewers speared with sausages are passed around. Shortly after, the campfire is surrounded by dangling sausage skewers and hungry eyes. I felt like a kid at Boy Scouts camp again. “So… do you like hockey?” said the 12 year old girl sitting beside me. She was visiting from Australia with her family and they had attended a Kamloops Blazers hockey game the day before. It was an interesting topic to start a conversation, but I was grateful for the icebreaker. We swapped stories about our respective countries, with the father and mother joining the banter. It reminded me what I like most about travel – connecting with strangers and learning about their world. The cool part about this international encounter is that I didn’t have to hop on an airplane to experience it. I was surprised to learn that most people in the group had never tried S’mores before. How is that even possible? If you are reading this and don’t know what S’mores is, do yourself a favour and click here to educate yourself. Rob provided a quick tutorial on the art of S’mores making and then proceed to hand out skewers for roasting marshmallows. Campfires are so much better with marshmallows. He then pulled out a book from his bag and began reading a famous Canadian poem. I can’t recall the name of the poet, or the name of the poem for that matter, but it’s not important. What I enjoyed most about this campfire moment was Rob’s enthusiasm and commitment to sharing Canada’s story. His genuine hospitality and storytelling certainly made the tour. I suspect he was having as much fun as the rest of the group. On the hike back to the village, Rob lead us down a forest trail and pointed out a number of wildlife tracks. As we hiked along a ridge towards the glow of the village lights, I took a deep breath and filled my lungs with the cold, fresh mountain air. Surrounded by the quiet of nature, I had a moment of reflection, one that reminded me how fortunate I am to live in this beautiful part of the world. Big thank you to Destination British Columbia and Discover Sun Peaks Adventures for providing a complimentary tour. It was a fun winter experience! This California girl has had her share of s’mores, but I have yet to try snowshoeing. Sounds like a lot of fun. We recently went snowshoeing in Banff for the first time. It was quite the adventure! It looks like you had an unforgettable tour. People we meet on a tour/in a place can make a difference in our lives, for better or worse, and change the way we see a thing or even some of our beliefs. Indeed. It’s so important to engage with the other guests on tour. They make up a big part of your experience.